Thailand's prime minister has told the BBC that troops have brought Bangkok under control after a day of battles with anti-government protesters. But a day marked by repeated violence ended with two people killed and dozens injured in clashes between residents and protesters near Government House. PM Abhisit Vejjajiva told the BBC that people were entitled to carry out peaceful protests - but not to riot. "We are confident that we are in control of the situation," he said. Later, Mr Abhisit confirmed the deaths of two people in clashes at Government House. "We have taken measures which have finally brought the situation under control, except around Government House," he said. "However this evening we sadly had clashes between demonstrators and local residents, and we are informed that two local people have been killed and several have been injured by gunshots." After days of gathering protests by supporters of ousted Prime Minister Thaksin Shinawatra - who want Mr Abhisit to resign - Monday saw a dramatic escalation on the streets. Soldiers were seen firing their guns into the air and into the crowds, while protesters burnt buses and threw firebombs in retaliation. By Monday evening, most of the remaining protesters on Bangkok's streets - said by Mr Abhisit to number no more than 20,000 - were concentrated around Government House, the prime minister said. BBC correspondent Jonathan Head, in Bangkok, says political turmoil has disrupted life in Thailand for so long now that it is easy to forget the country was once seen as a paragon of stability. The situation in Bangkok was fluid throughout the day, our correspondent says, with soldiers at times showing restraint, but at other times being undisciplined. Monday is the start of a three-day holiday for the Thai New Year, and some protesters handed out pink roses to soldiers as a sign of peace. But in a BBC interview, Mr Thaksin said: "The situation in Thailand is of very brutal suppression." And he clarified his previous call to supporters for a revolution, saying he meant a "peaceful revolution". "All the protesters come with bare hands, they come with peace, they are asking for a true democracy for all," he said, although he did acknowledge that some had "sticks and stones". Mr Abhisit, the current prime minister, declared a state of emergency on Sunday after the protests forced the cancellation of a major meeting of Asian leaders in the resort city of Pattaya. But Army spokesperson Col Sansern Kaewkamnerd said soldiers were not firing real bullets in Monday's clashes. "If the protesters show that they intend to hurt the officials, we will use military training rifles on them with blank bullets made from paper, which will not hurt the protesters." 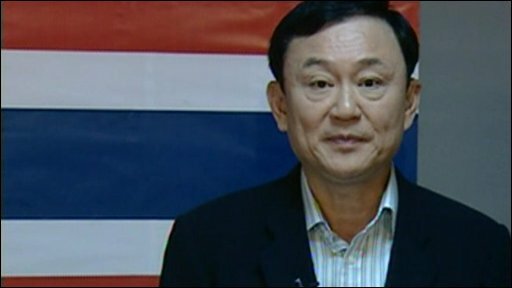 Speaking to the BBC from the Middle East, Mr Thaksin accused the army of lying about the shooting in Bangkok, saying that soldiers had not fired into the air as the army said, but into crowds with live ammunition. Earlier, Mr Abhisit said 70 people had been injured, including 23 soldiers. He added: "If the people want to demonstrate peacefully, if they want to exercise their constitutional rights they are welcome to do so, but they cannot riot, they cannot incite people to break the law, they cannot intimidate and use violence against other people." "We will try to find the best solution we can over the next couple of days," he added. Under the current state of emergency, gatherings of more than five people can be banned, media reports can be censored and the army can be deployed to help police maintain order. Are you in the area? Have you been affected by this incident, or have you seen or heard anything? Send your comments or pictures using the form below.